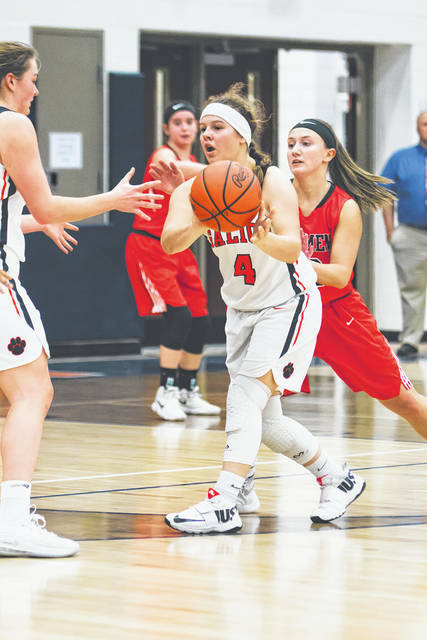 GALION — Back on Wednesday, January 16, the Galion Lady Tigers played host to the visiting Bucyrus Lady Redmen in non-conference, girls hoops action. The Tigers entered the contest on a 12-game losing streak but that would all come to an end as they defeated their guests by a final score of 48-44. With the victory, Galion gets back into the winning column for the first time since their season opener against Crestline and improve to 2-12 overall on the season while remaining 0-9 in Mid-Ohio Athletic Conference play. In the first quarter, both squads got out to fast starts with the advantage going to Galion; 19-14. The two teams would play neck and neck in the second frame, both scoring 11 points to send the game into halftime with the Lady Tigers up by a score of 30-25. To begin the second half, both Galion and Bucyrus would post just seven points as the offense appeared to slow a bit to send the game into the final quarter of regulation with the home team ahead; 37-32. The Lady Redmen would finally outscore their hosts in the fourth but it wouldn’t be enough as Galion earned the four-point victory. Gabby Kaple led the way for Galion, scoring 13 points while also grabbing five rebounds, dishing out two assists and swiping a steal on the defensive end. Gracie Groves posted nine points to go along with 12 rebounds, two blocks and a steal. Mykenzie Debord finished the game with eight points, five boards, two assists, a pair of blocks and a steal and Teanna Greter netted seven points, two rebounds, three assists and a steal. 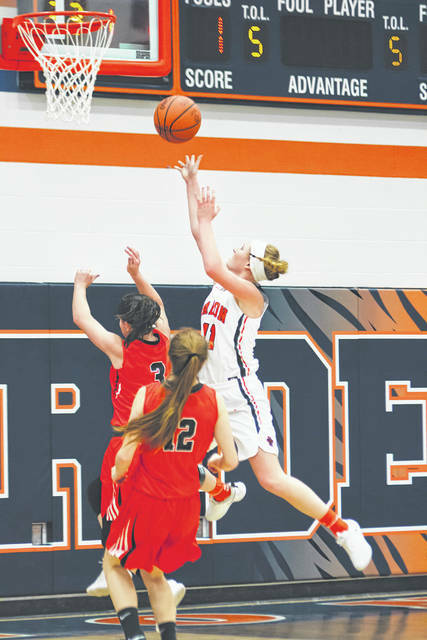 Morgan Kimble contributed six points, nine rebounds, three blocks and a steal while Natalee Perkins scored five, grabbed five rebounds, dished three assists and collected two steals to round out the Galion scoring. Heaven Phelps also had an assist in Wednesday’s action. After hosting Harding on Friday night, Galion will next host the Clear Fork Lady Colts on Thursday, January 24. NORTH ROBINSON — The Colonel Crawford Lady Eagles were on their home floor at the Mac Morrison Gymnasium on Tuesday evening as they played host to Northern-10 Athletic Conference foes, the Carey Lady Blue Devils. It would be the home team picking up the conference “W”, defeating Carey by a final of 30-26. With the win, Crawford improves to 9-5 overall on the season and sit at 5-5 in N-10 play. The Lady Eagles are set to play host to the Mohawk Lady Warriors on Saturday, January 19 and will be on the road against the Wynford Lady Royals in conference play on Tuesday, January 22. GALION — On Thursday evening, the Galion Tigers boys hoops squad welcomed the visiting Pleasant Spartans to town to compete in MOAC play. The two teams would need overtime to decide a victor with the win going to the visitors; 61-54. With the loss, Galion falls to 4-8 overall on the season and 2-6 in conference play. Galion took the lead after the first eight minutes of play; 15-11 and would outscore Pleasant in the second quarter to take the 31-24 lead into the locker room at halftime. However, the Spartans would appear to regroup and came out in the second half to score 24 points while holding Galion to just 17 to send the game into the extra frame. In overtime, Pleasant remained tough on the defensive end and outscored the Tigers 13-6 to pick up the victory. The Tigers will be at home on Saturday, January 19 against the River Valley Vikings in MOAC action. On Tuesday, January 22, Galion makes the short trip to Northmor to face the Golden Knights in non-conference play. The busy week continues for the boys squad as they head to Marion for a meeting with the Harding Presidents on Friday, January 25 before heading to New Washington to clash with the Buckeye Central Bucks the following day. GALION — The Northmor Golden Knights returned to their home floor on Tuesday, January 15 to play host to Knox-Morrow Athletic Conference foes, the Fredericktown Freddies. Northmor would get back in the winning column as they edge F’town by just two points; 46-44. The Golden Knights improved to 5-6 overall with the win and are now 4-4 in KMAC play. With the win on Tuesday, Northmor head coach Zach Ruth picked up career win number 95, making him the winningest coach in school history. The Freddies would take a 10-9 into the second quarter and would outscore the hosting Knights to take a 30-21 into the half. Northmor would appear to hunker down on the defensive end though and would use a 25-14 mark in the final 16 minutes to edge Fredericktown. Blake Miller led the way for the home team, scoring 21 points while grabbing eight rebounds, dishing out two assists, swatting four blocks and also recording a steal. Other statistics for Northmor in Tuesday’s win were: Logan Randolph- 11 points, two rebounds; Cole Dille- 8 points, 9 rebounds, 2 assists, 1 block; Hunter Mariotti- 4 points, 3 rebounds, 1 assist, 1 steal, 4 blocks; Trevor Gekler- 2 points, 1 rebound and Alex Tuttle- 1 point, 2 rebounds, 1 assist, 1 steal. The Golden Knights will play host to the Galion Tigers on Tuesday, January 22 in non-conference play before heading to Cardington for a KMAC clash with the hosting Pirates on Friday, Januray 25.